How to create the most successful intellectual project . 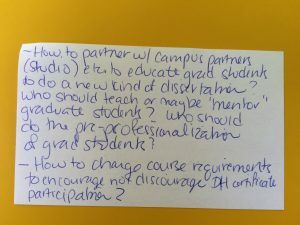 . .
One participant raised the issue of whether we want to encourage students to take a “both/and” approach—that is, to write a traditional dissertation and create more innovation manifestations of research findings. This contributor went on to note that her department had success in placing students in academic jobs at places that required a traditional dissertation. 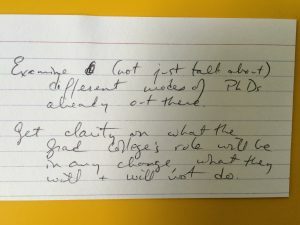 Another person expressed concern about a possible “thinning” of traditional disciplinary training, even as she conveyed enthusiasm for students developing facility with new digital tools and platforms. 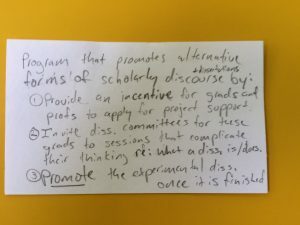 Another person broached the question of whether we are open to NOT requiring a “both/and” approach, which led to several people inquiring about the purpose of the PhD. “What do you need it to be a record of?” one person asked, going on to say, “A thesis is not a record of everything someone has done—there are other ways to assess students’ abilities as teachers, organizers, et al.” We should be thinking about what creates the most successful intellectual project, another suggested, going on to say that choosing the right platform should be part of the intellectual project. 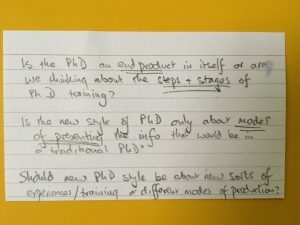 One participant noted the inflationary tendencies in dissertation requirements—humanities dissertations were no always as long as they are today. Another noted that it would be possible to highlight the abilities one develops while writing a dissertation: e.g. developing an argument, making connections to others’ arguments. Several people were intrigued by Sidonie Smith’s suggestion that students might complete a “suite” of essays, perhaps pitched to different audiences. 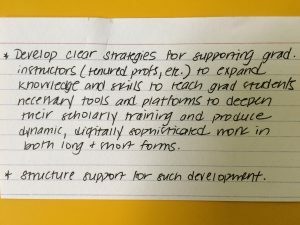 One person wondered if the comps level would be the place to start something like this; another expressed an interest in getting students to write for different audiences (and at different lengths) from the first year of grad school. One person suggested a seminar “paper” that could have linked references and outlinks to digital artifacts. Another participant, noting that employers request project management skills, expressed the view that a graduate student who had developed a large-scale instructional project, requiring her undergraduate students to work together and publish an online project, would be able to demonstrate the project management skills she used as she designed and orchestrated a complicated classroom effort with many moving parts. Touching back on our grant proposal’s attention to social media platforms, such as Twitter, we talked about how communities of scholars living in far-flung places have new opportunities to talk about their common interests. 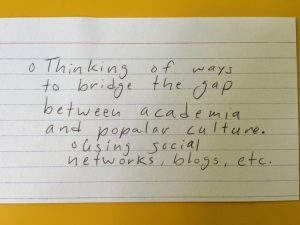 We discussed how graduate students, even as they begin their training might tap into diverse online communities, and begin to develop scholarly identities. Before we dispersed, participants wrote down some preliminary concerns and priorities on index cards. Next Next post: People nestle in like ticks to discuss the subjunctive . . .